The School of History is deeply committed to supporting your employability development, not just through organising extracurricular events and work experience opportunities, but through the core aspects of your degree. History graduates are highly sought-after by employers, because you gain the skills they want through your studies. For example, taking part in discussions in seminars is applying your ability to communicate effectively, to state an argument, to recall and deploy information, to consider the views of others, and adapt to new information and viewpoints. The same applies to researching for an essay – finding appropriate sources, sorting the relevant information from the irrelevant, cross-referencing and comparing multiple, sometimes conflicting facts, analysing the arguments of others against your own knowledge – or giving a presentation – communicating information confidently, condensing information to its essential points, responding to questions. These skills (see here for a fuller list) are essential for a huge range of jobs, and you will develop them as you expand your historical knowledge through your degree. Alongside the more generic employability skills you will gain – the ability to write a good CV and job application, to find the best opportunities for you, to impress at interview – these skills put you in an excellent position to seek out and secure the career that you want. There is a huge volume of information out there regarding graduate employment prospects and destinations. To give you some idea of the picture for history graduates, below is the History entry in the 2018 edition of the What do graduates do? document prepared by Prospects and the Association of Graduate Career Advisory Services. 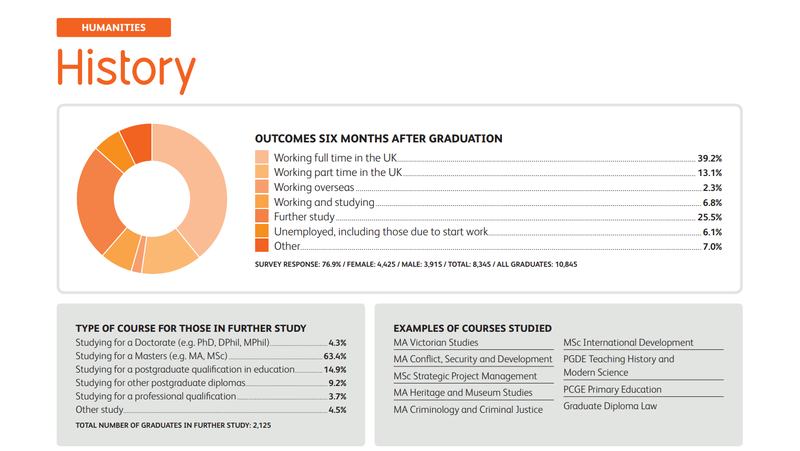 This collates survey responses from tens of thousands of graduates each year, and shows a broad overview of the kinds of jobs history students go on to immediately after graduating. Of course, the job you get straight after graduation isn’t necessarily going to be the first one on your career path, but this does make it clear that a history degree prepares graduates for a huge range of jobs. Note: open each chart in a new tab to see a bigger version if the font is too small.